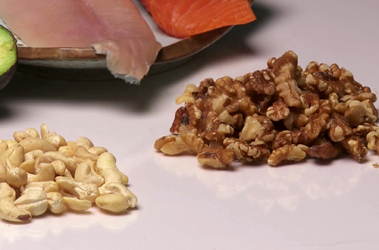 You may have heard that there are several kinds of fats. But how do we know which to avoid, and which are okay to eat? We need some fat in our diets. Fats provide energy. They help build hormones and cells. While all fats are high in calories, some fats are better choices than others. Choose unsaturated fats. They can actually help lower your cholesterol. These healthier fats usually stay liquid at room temperature, and are found in most vegetable oils. Good fats are also found in avocados, some fish, and nuts. Saturated fats and trans fats are not good choices. They can clog up the arteries that carry blood to your heart. Most of these fats stay solid at room temperature. They’re found in fried foods, fatty meats, and baked goods. Just like there are several sources of fats, there are also several sources of carbohydrate. Carbohydrate is found in many foods. It provides fuel for our heart, brain and muscles. But, as with fats, some carbs are better than others. And if you have diabetes or pre- diabetes, controlling carbohydrate is important because when you eat too much carbohydrate, your blood sugar may rise too high. The best carbs provide fiber. Fiber can help lower cholesterol. We can get fiber from fruits, vegetables and beans, as well as whole grain products – whole wheat pastas and breads, and brown rice. It’s best to eat at least three ounces of whole grains per day. Check the food’s packaging to make sure that’s what you’re getting. The not-so-good carbohydrate, like white flour and white sugar, is usually higher in calories and has little nutritional value. For too many of us, these make up too large a part of what we eat and drink everyday. Choosing less white bread and fewer soft drinks and sweets is a move in the right direction. Fats and carbohydrate. Choose the ones that are better for you, and you’re on your way to healthier eating for life.